For those of you in the States, this Monday was Labor Day. Taking a mandatory day off from my regular gig as a grant writer was nice, but it also threw my entire week out of wack. That is no excuse for a late chapter in Barghest, Part II – I know. But, I hope you will still enjoy Chapter 12: Character Assassination. It took me a while to work him into a scene, but Rodriguez finally makes an all too brief reappearance. There is something about an over-sexed, hair-gelled, pretty boy that I just love. Maybe it’s the potential for one liners. Maybe it’s the potential for awkward and uncomfortable silences. I like both. In any case, Chapter 12 brings Maker’s gang back together and that is always the start of something amazing. And, as we learned in Part I: Siege Engine, usually destructive. And bloody. And probably some of the worst workers’ compensation claims ever. Spines don’t regrow themselves, you know. Aside from publishing another chapter in my sci-fi serial, I spent the greater portion of the early part of this week developing a routine for social media and making this. If you are interested in updates on posts, new chapters, and reading recommendations, you can follow me @susanamund . 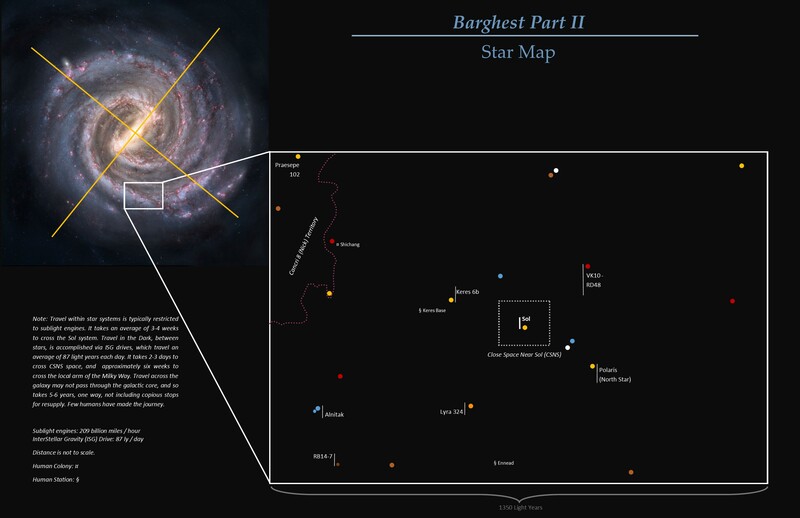 If you are interested in how far Keres Base is from Earth, check out the map. Here’s hoping that next week is more on schedule.